Between the Cotswolds and the Malvern Hills, at the confluence of the Rivers Avon and Severn, stands the ancient town of Tewkesbury. 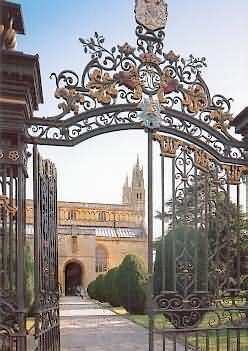 Tradition says that it was the site of a Saxon abbey founded around the year AD 715. The abbey's declining fortunes led to its eventually becoming absorbed by Cranborne Abbey in Dorset. All traces of this building have long disappeared. 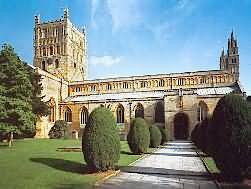 In 1087 Robert Fitzhamon, a kinsman of William the Conqueror, acquired the Manor of Tewkesbury. 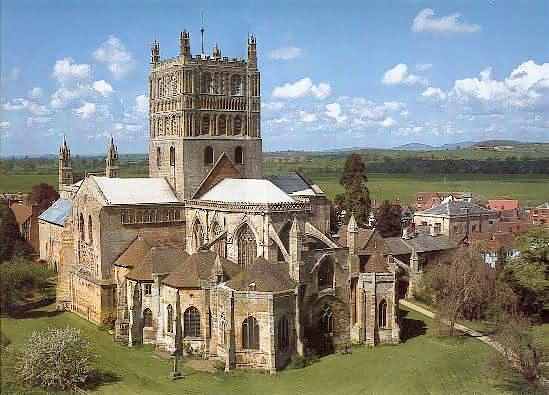 Giraldus, Abbot of Cranborne, anxious to extend his dominion, was brought to Tewkesbury and the present abbey was founded with Giraldus as its first Abbot, in the last decade of the 11th century. 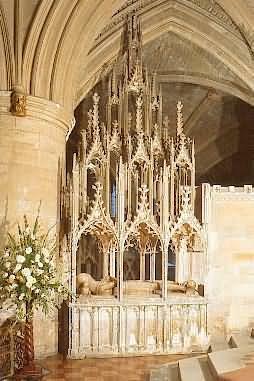 Robert Fitzhamon died in 1107 from wounds received at the siege of Falaise and his body was buried in the Chapter House of Tewkesbury Abbey. After Fitzhamon's death, the building work was continued by his son-in-law, Robert Fitzroy, an illegitimate son of King Henry I, who saw the work through to the completion of the Norman phase and the consecration of the church in October 1121. Giraldus had died in 1110 so neither of the founders survived to see the abbey completed. The consecration ceremony was performed by Theulf, the aged Bishop of Worcester, assisted by four other bishops. Tewkesbury Abbey bears significant resemblances to its sister church of St Peter's, Gloucester (the present cathedral) in the nave elevation and the ambulatory plan. Twin western towers seem to have been originally planned on the lines of those at Southwell Minster, Nottinghamshire. An indication of this is the thickness of the walls and the solid bays at the west end of the north and south aisles. But plans for this were abandoned. However the superb Norman arch together with its flanking turrets give us what is undoubtedly one of the finest west fronts in England. 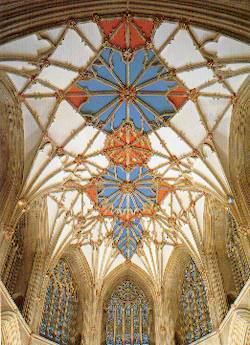 The Norman choir and transepts of Tewkesbury were probably the earliest four-storeyed buildings in Europe. The tower, completed in the latter half of the 12th century, is certainly the largest and finest Romanesque tower in England and dominates not only the building but also the town and the surrounding countryside. Its sturdy walls are 46 feet (14m) square and 148 feet (46m) high. The ornate upper stages with the graceful interlaced arches are characteristic of the late Norman period. Only the pinnacles and battlements are not original, having been added in 1600. On all faces of the tower can be seen the inverted `V' which indicates the original roof line before it was unfortunately lowered in 1614. Most of the conventual buildings were on the south of the present church We have become accustomed to seeing the abbey church serene and almost isolated in its churchyards and lawns, and it is difficult to imagine it as it once was, the centre of a huddle of buildings, hemming it in on every side. On the south side of the nave there are remnants of the 15th-century cloister. The adjacent vaulting indicates the style and the width of the old cloister walk, which was some 80 feet (25m) square. On its eastern side were the slype (a passageway from the monastery into the church) and the Chapter House with a dormitory above. The entrance from the dormitory, now built up, can be seen in the south transept wall. When we enter the church and stand at the west end of the nave, our view is at once dominated by the 14 enormous columns, each more than 30 feet (9m) high and well over 6 feet (2m) in diameter and surmounted by a Romanesque arch. Above is a rather insignificant triforium with twin openings to each bay. (After the dramatic height of the nave columns, perhaps any triforium would appear less than adequate.) The Norman clerestory cannot be fully appreciated owing to the 14th-century vaulting which frequently breaches it. There is no trace of a Norman vault and one must assume that there would have been a wooden ceiling spanning the nave. About two-thirds of the way along the nave is a shallow step stretching from wall to wall but masked now by three ramps. This is a very significant point in the abbey plan, for it is all that now remains of the screen which divided the people's part of the church from the monastic choir. The impression of the medieval church would have been one of bright, almost garish, colour. The walls were vivid with biblical scenes and the pillars and arches boldly patterned. Of this colour very little now remains. Some may be discerned on the collars of the nave arches nearest the crossing. On the pillars by the step are the marks of the `risers' of the two stone staircases which once existed here and which provided access to the top of the screen. From here the gospel would be read to the laity assembled in the nave. The present Lady Chapel in the south transept is the survivor of a pair, one in either transept. It is a perfect example of a late Norman apsidal chapel. The. east end of the church once had a magnificent Lady Chapel of which little now remains. It is believed that in the early 16th century this earlier eastern chapel was pulled down. Excavations have revealed foundations 80 feet (25 m) long. The pillars of the choir, originally as tall as those in the nave, were cut down to half their height in the 14th-century reconstruction to provide the basis of the new work. In the south ambulatory are the tombs of some of the earlier abbots. Among them is the tomb of Abbot Alan who died in 1202. He came to Tewkesbury as Abbot having been Prior of Canterbury and it is his first hand account of the martyrdom of St Thomas Becket, still extant in the British Library, which tells us most of what we know of that tragic event. c.1087 Robert Fitzhamon begins building. 1102 Giraldus and 39 monks move from Cranborne. 1121 Consecration of the abbey. 1178 Monastic buildings destroyed by fire. c.1310-40 Norman wooden ceiling replaced by vault. 1344 Choir and eastern chapels reconstructed. Choir windows inserted. c.1390 Despenser and Fitzhamon chantries constructed. 1471 Battle of Tewkesbury. 1540 Monastery dissolved by King Henry VIII. Abbey purchased from King by townsfolk for £453. Lady Chapel and monastic buildings dismantled. 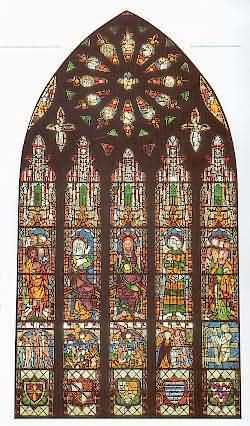 1686 West window inserted. 1875-9 Restoration by Sir George Gllbert Scott. 1971 Queen Elizabeth II distributes the Royal Maundy at Tewkesbury Abbey. 1997 Milton organ restored. Visitor Centre opened by HRH Princess Margaret.